Laura Barber-Riley- Equestrian Artist: Weekly Bodey Painting! 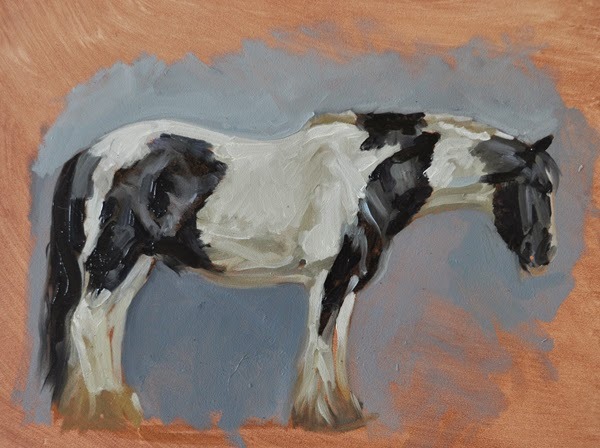 My new little spare room studio is fast filling up with newly started paintings; I am keen to enter six to the Society of Equestrian Artists annual exhibition and the deadline is only 6 or 7 weeks away! Lots to do. That said, with my brilliant week painting in Somerset fresh in my mind I am remaining committed to my work from life and have thought myself up a project to keep me focused over the summer! 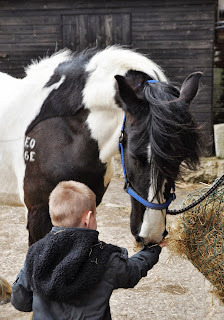 Meet Bodey, my wonderful friend Jo's beautiful cob, whom I am lucky enough to ride regularly. He is a real star of a horse; fantastic fun to ride, safe as they come, and great with children too. Bodey is such a credit to Jo, I adore him! I have been meaning to paint him for ages but somehow haven't got round to it, until today. Feeling inspired and armed with my new easel (which makes getting set up and packed away when painting outside so much easier) I managed a quick (one hour ish?) oil sketch today, and now plan to paint him every single week, without fail. I have seen before just how much I improve when I paint the same thing over and over again, so I am hoping that when I look back on 'Bodey I' several weeks down the line I'll see a big difference compared with 'Bodey V', and so on. My expectations for today's painting were low and I wasn't sure whether knowing him well would help or hinder me? I worked fast and the end result wasn't as bad as I was expecting! Bodey was a great model, stood very nicely for me. I got in a bit of a muddle with his ever shifting hind legs but wasn't too worried about fiddling fixing them, wanted more just to capture him today and get a feel for painting him. Thoroughly enjoyed it! I'm very grateful to Jo for being so very generous with her lovely horse. Bodey and I having fun! Ultimately I'd love to one day get a life sketch accepted into the SEA exhibition... long way off being able to produce that sort of standard but perhaps with some hard work I might just manage it eventually! a friendly horse and tour son certainly seems to know that. Good luck with your weekly painting. Sounds a fantastic place, variety is the spice of life! Both of my children love Bodey, he really is great! Thanks very much for your kind comment! Great painting Laura - I'm amazed at what you achieved in just one hour. And pleased that you're enjoying Bodey. 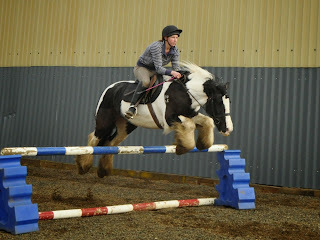 Sadly I lost my old girl to cancer in November - she was a middle weight cob, shire cross Irish draft and great fun. A big jump and some success with dressage tests (when I could keep her attention). I love the 'heavier' horses! Nice to hear from you Sue, really sorry to hear about your mare, she sounds so sweet! I have always had TB types or WB but would definitely consider a cob for my next horse (which won't be for a couple of years yet!). Like your girl, Bodey has a great pop in him and can do a cracking test too- perfect for someone like me who just wants to get on and have fun. Art Blogs 4 U - directory of art blogs on the web!